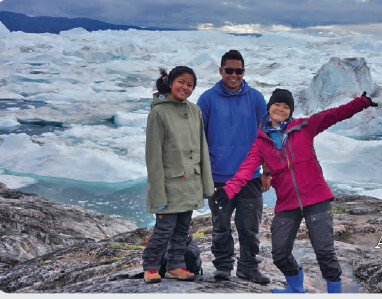 Imagine three teenage students from the tropical islands of Micronesia walking on the ice of the Arctic. I’m telling you, as a student who went through the experience, it was indeed the best, most powerful, and the most life-changing experience of my life. But, I’ll start off by saying this: the experience is very hard to explain. To understand it best is to experience it oneself. Students On Ice is a program that accepts students from countries all over the world to take them on an expedition through the Canadian Arctic and off to Greenland. The program teaches students about climate change, Inuit culture and history, and many other scientific studies, arts, and humanities that any teenager may want to learn about. As a Micronesian in the program, I noticed some similarities between the Inuit people and the Micronesian people. These similarities include the history of the people, some parts of the cultures, and facing the effects of climate change. I learned about the Inuit culture and history. The Inuits were once living their own lives before they were introduced to the Europeans. They lived in nice, warm igloos, they hunted and gathered food, and they even respected each and every other person in the tribe. Similar to the Inuits, past Micronesians lived in nice, breezy huts, farmed and fished for their food, and respected every single person on their island. These two groups of people share similar lifestyles. They’re only slightly different because of their environment and the climate they’re used to. Inuits were also removed from their original lands and were also introduced to modern government and businesses. Similar to Micronesians, specifically and the Marshallese, were removed completely from some of their islands to satisfy the U.S. needs. Inuits also depended on the food around them and they’ve made it their cultural food. Their type of food includes seal, walrus, narwhal, caribou, and many other animals. Before eating these animals, they skin them and use their skin to make clothing. On the other hand, Micronesians have breadfruit, banana, taro, yam, and many other recipes that are made for cultural activities. They also use plant fibers of their surroundings to make traditional clothing. These two groups of people may live in extremely different climates and yet have very similar lifestyles. I also learned about climate change. I learned about how the ice melts to affect sea level rise. I learned about how the earth is heated to cause the melting of the ice, and how the melting of ice in turn makes the earth heat up even more. I saw with my own eyes the melting ice that causes our home islands to erode away. Being in a small boat in front of a glacier and witnessing icebergs calve from it and fall into the ocean was both really amazing and also heartbreaking. I was glad I got to see it with my own eyes and also very heartbroken when the thought of my own home came to my mind. The ice falling into water in front of me is what increases the sea level back home. Likewise, my Inuit friends were devastated to watch the ice in their home melt. The melting of their home is the sinking of my home. Climate change is very real and has to be dealt with. I learned so much on this trip and I recommend every student in Micronesia to apply and learn from this—the more, the better. Lastly, I would like to thank the help of my parents, friends, Xavier High family, and most especially Island Research & Education Initiative (iREi) from Pohnpei for funding my expedition. All thanks to you, I learned so much and I’m willing to make this world healthy and alive.